Tammy's Spot: Sow How You Been? My card today is a happy card that features Oinkers from The Alley Way Stamps! I love cards that make me giggle and smile! This makes me giggle and smile too! 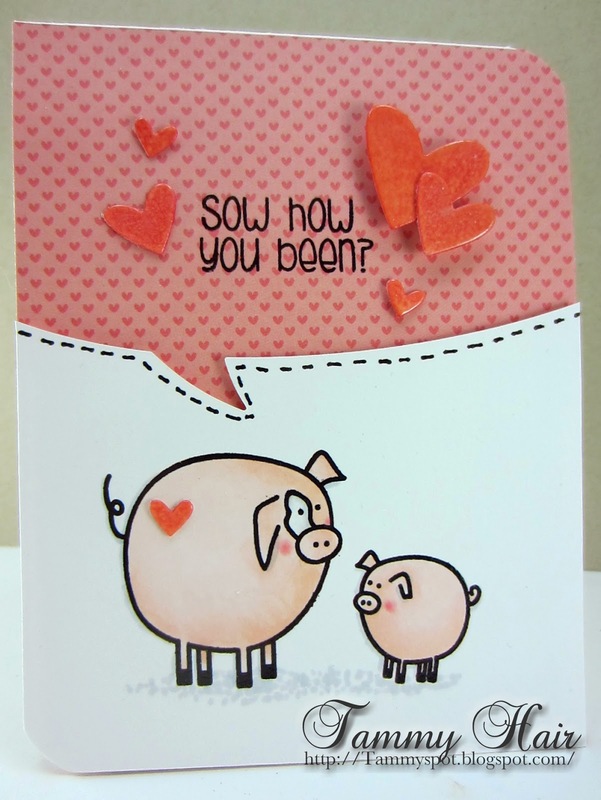 Adorable oinkers and I love the sentiment! What an adorable card! It makes me smile too! Makes me giggle and smile too! So cute and fun. Love the way your colored the oinkers - they look like the real thing! CUTE! Sensational layout for your talking pig, Tammy!! I love how you have created your conversation bubble! Super cute card! Great card Tammy, love it! This is such a fun card! Love the speech bubble. Hahaha! Cute! I have this sentiment, too (different company), and a pig to go with it. So much fun! LOLOLOL. This is soooo cute. I like the way you did that speech bubble. What a fun sentiment Tammy and two very cute pigs! I love funny and punny cards too, and this one definitely fills the bill!